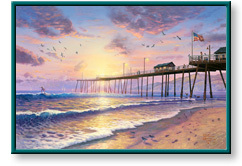 Footprints in the Sand and other artwork by artist Thomas Kinkade can be viewed in our artist slideshow. Footprints in the Sand by artist Thomas Kinkade and other Thomas Kincade art, art work, artwork, canvases, giclees, images, limited editions, open editions, paintings, paper, pictures, posters, and prints can all be found at Christ-Centered Art. "The parable about footprints in the sand, which reminds us that in times of personal pain God is there to carry us through, resonates for me with profound truth. My Footprints in the Sand takes us to the charming coastal town of Pismo Beach, California to explore the interweaving of the human and spiritual elements of our lives. "The scene bustles with human activity — families strolling the pier, fishermen, even my first-ever portrayal of a surfer. The busy people are bathed in the heavenly light of sunset, and flocks of gulls, like messengers from Heaven, descend from the glorious sky. "Two pairs of footprints in the sand narrow to one, reminding us that when our human lives are troubled, God will always be a constant guide and steady support." Footprints in the Sand by artist Thomas Kinkade as well as other open and limited edition inspirational paper art prints and canvases, giclees, images, lithographs, paintings, pictures, posters, and reproductions by renowned Lightpost Publishing, Media Arts, and The Thomas Kinkade Company artist Thomas Kincade can be viewed and purchased at special sale prices at Christ-Centered Art.